The message is clear. You can prepare for the SAT. And the more you prepare, the more you’ll boost your score. That’s good news because it means your score and your future are in your own hands. But it’s going to be tough to sit down and train for the SAT when you’ve got countless diversions tempting you at all times. And studying for the SAT isn’t like studying for school: there’s no teacher to scold you or give you a D. Getting yourself to do the work is up to you. But there are ways to make yourself more disciplined. Study the particular math concepts that give you trouble. Concrete goals allow you to come up with a specific plan. This will make the time you spend preparing for the SAT much more efficient, leaving you more time to enjoy your life. When setting a target score, be honest and realistic. Base your target score on the range the schools you want to go to will expect. A good target score should be 50–100 points above the average for those schools. You can also gauge your target score by your first practice test. If you score a 500 on the Math section of the first practice test, don’t set your target score at 750. You’ll just get frustrated and you won’t know where to focus your preparation time. Instead, your target should be about 50 points higher on each section than your score on your first practice test. That may not seem like much, but 50 points on each section of the test will raise your total score by 150 points! The target score you choose plays a major role in your test-taking strategy. If you reach your target score . . .
Give yourself a cookie or, if you’re a health freak, a carrot. But just because you’ve hit your target score doesn’t mean you should stop working. In fact, you should view reaching your target score as proof that you can do better than that score: set a new target 50–100 points above your original, pick up your pace a little bit, and skip fewer questions. Slow and steady wins the race and beats the test. By working to improve bit by bit, you’ll integrate your knowledge of how to take the test and the subjects the test covers without burning out. If you can handle working just a little faster without becoming careless and losing points, your score will certainly go up. If you meet your new target score again, rinse and repeat. You should treat your SAT prep time like you would every other set-in-stone extracurricular activity you pursue. We know studying for the SAT will never be as thrilling as soccer practice, the school newspaper, student government, or actually, anything else at all. That’s precisely why you need to schedule a set time for SAT studying. Once you’ve scheduled your SAT time, studying won’t seem like an evil intruder robbing you of an otherwise happy life. You can schedule your life around the time you’ve set aside to study. It’s also a good idea to set up a place to study. This means somewhere quiet and out of the way, where televisions, computers, friends, siblings, and other distracters do not thrive. You may even drag yourself into the nearest public library. Point is, do whatever it takes to find a time and place to fit the SAT into your life. The SAT gives you the chance to use your parents’ nagging to your own advantage. If you really don’t think you can force yourself to study on your own, make your study schedule public and ask your parents to enforce it. It may sound like a brutal last resort, but desperate times call for desperate measures. Studying for the SAT with friends will make studying more bearable, so you’re more likely to do it. And with a friend, you can work on tough concepts together, compare strategies, and occasionally gossip. Working with another person can help your memory too, since you’re less likely to space out without realizing it. If you don’t study for the SAT now, you won’t get the score you want on the test. Then you’ll have to take it again, and then you’ll have to study and panic at the same time. Back before we got involved with SparkNotes, we were both professional boxers. Our coach used to tell us, “Son(s), you gotta get in, get hit, and get out.” That’s just what you want to do to the SAT. Get in the habit of studying furiously, hit the SAT hard on test day, and get out of there with the score you want. Then you won’t have to think about the SAT ever again. No rematch. NEVER. An essay grading service that offers a grade and analysis for the essay questions contained in this book. SparkNotes will grade your first essay for free. The three practice tests in this book, backed by diagnostic software that immediately analyzes your results and directs your study for efficiency and effectiveness. The entire book, fully searchable, with all the latest updates to keep you up to speed. In addition to the SAT, SparkNotes Online Test Prep also covers the ACT and the most popular SAT II tests. And once you’ve bought this book, you can get access to the test prep for any of those other tests for $4.95, about 10 dollars less than it would cost you to buy the book. Thou shalt go to the correct test center. Thou shalt bring lots of no. 2 pencils. Thou shalt check your calculator batteries. Thou shalt be careful filling in your answers. Thou shalt know the instructions for each section. Thou shalt use your test booklet as scratch paper. Thou shalt answer easy questions first. Thou shalt bring bread and water. 2. Thou shalt bring lots of no. 2 pencils. Zero pencils is not enough. One pencil is not enough. Two pencils is not enough because pencils break easily, and you don’t want to waste time sharpening. Three pencils, minimum, is enough. But why stop there? Bring five. Bring 10! You could always share them with your desperate, broken-penciled friends. 3. Thou shalt check your calculator batteries. True, the chances are low that your calculator will give out on you during the test. But do you really want to take that chance? Think of the embarrassment. Think of your brutally lower math scores. Think of Justin’s cousin Jeff, whose calculator died mid-SAT, forcing him to abandon his score sheet and to retake the test on the day of his sister’s college graduation. This particular type of SAT tragedy can be avoided. Get a new calculator, or get new batteries. 4. Thou shalt be careful filling in your answers. The SAT scoring computer is an unintelligent merciless machine. It has no soul. If you answered a question correctly, but somehow made a mistake in marking your answer grid, the computer will mark that question wrong. If you manage to skip question 5, but put the answer to question 6 in row 5, and the answer to question 7 in row 6, and so on, thereby throwing off your answers for an entire section . . . well, that’s why humans invented the word catastrophe. It’s amazing how often this happens under the time pressures of the SAT. But there’s a foolproof method to ensure it doesn’t happen to you: Talk to yourself. As you fill in the answer sheet, say to yourself: “number 23, B; number 24, E; number 25, A.” But do it quietly. You don’t want to give your answers to the entire room. 5. Thou shalt know the instructions for each section. The SAT is a timed test, and every second counts. Why waste time reading the instructions when you can know them inside out before the test? Just know what they say and what you have to do for each type of question on the test. Then you can skip right over them on the real test. 6. Thou shalt use your test booklet as scratch paper. For some reason, certain students seem to think they have to keep their test booklets clean and pretty. You don’t. When you finish taking the SAT, your test booklet is thrown away, recycled, and used to make egg cartons. So write all over that thing. Cross out answer choices. Mark questions you want to skip and come back to. Underline important statements. Draw sketches. Write equations. Thinking through problems, especially math problems, is easier when you have something to look at. But, because the SAT is a timed test, and since your work doesn’t matter, there’s no reason to do more work than necessary to solve a problem. Speed matters on the SAT, so don’t try to impress the test with excellent work. Do only what you have to do to ensure that you get the right answer. 7. Thou shalt answer easy questions first. You’re allowed to skip around within any timed section on the test. So if you’re in the first Critical Reading section of the test, you could skip between Sentence Completions, short Reading Comps, and long Reading Comps. And since all questions, easy or hard, are worth the same number of points regardless of difficulty, it makes sense to answer the questions you find easier first and save the more time-consuming, difficult questions for later. This way you’ll be sure to accumulate as many points as possible. You’ll also make sure that you’ve at least glanced at every question on the test and aren’t giving away points. While taking seven minutes to solve a particularly nasty Sentence Completion may feel like a moral victory, it’s quite possible that you could have used that same time to answer three other short Reading Comp questions. Do not be scared to skip a question that’s giving you a lot of trouble—just remember to mark it so you can come back to it if you have time at the end. 8. Thou shalt avoid carelessness. There are actually two kinds of carelessness: The Fast and the Faithless. Both can cost you precious points on the SAT. Here’s a bit more detail about each. The fast: The first type of carelessness comes from moving too fast. In speeding through the test, you make yourself vulnerable to misinterpreting the question, overlooking one of the answer choices, or simply making a mathematical or logical mistake. The SAT is filled with traps that prey on the speedy. The faithless: The second type of carelessness results from lack of confidence. Lots of students are so nervous about the SAT that they lose faith in themselves as soon as they encounter a tough question. They just assume they won’t be able to get the correct answer. Never assume you won’t be able to answer a question without looking at it and giving it a moment’s thought. 9. Thou shalt bring bread and water. The old SAT was a long, exhausting test, and the new SAT is even longer and probably more exhausting. You’ll feel like a prisoner, stripped of your freedom for almost half a day, but that doesn’t mean you can’t bring something along to eat and drink. You definitely can’t be swigging back Gatorade during the test itself, but you will have a few breaks in between sections so you can do stuff like go to the bathroom, eat an apple, and chug down some high-octane SAT protein powder or whatever concoction you create to give yourself energy. Just be sure to bring some fuel to power you throughout the test. 10. Thou shalt relax! The SAT is almost always portrayed as a harrowing, life-ruining stressfest. Countless magazine articles depict helpless teenagers holding their heads in panic, sweat pouring down their foreheads as they take the test. That does not have to be you. That shouldn’t be you. One of the best things you can do to chill out before the test is take the night before it off completely. That might sound crazy, but if you’ve spent weeks or even months in advance preparing for the test, you don’t have to cram or panic. You’ve done all that you can do to ready yourself for the SAT and nothing you do the night before will likely make any difference. So take it easy. Go see a movie or get together with friends. Clearing your head before the test will put you in a strong position to take it on with confidence early the next morning. 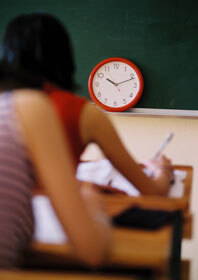 Standardized Test Timeline for High School Students: What to Take and When?